Gentlemaniac - "Secrets Of The Megaliths"
From North Carolina, Gentlemaniac plays a variety of songs, mostly in a drugged country style, sometimes with psychedelic elements, and often with interesting guitar sounds that put the music off the beaten path by contrasting sharply with the more standard styles that form the basis of the songs. Like all the Szum releases I've heard so far there's an enjoyably raw quality to Gentlemaniac's music, but if you listen closely you'll realize there are moments of pretty good musicianship and some decent politically bent songwriting on the album. Among the highlight tracks is the opener, "What A Ride", which features strained whining and sliding acoustic guitars that create a trippy atmosphere for this strangely countrified cross between Syd Barrett and folk-psych. "Closure" is a similar tune with a cool wailing guitar sound running throughout. "Pointing At Pie" and "Something You Need" are characterized by a country style, with the former having a bit of a Grateful Dead feel. "You Don't Know What It's Like" has vocals that are a ringer for George Harrison and a stinging guitar sound that provides a welcome contrast to the steady boppin' beat of the music. "Just Can't Win" is a cool loungy tune with twangy wah'd guitar. And "Promenade" is very different being an oddball screechy but trancy tune that reminded me of Tuxedomoon. Gentlemaniac have a bluesy side as well. "Trust" has some cool dirty blues slide acoustic guitar. "Talking In My Sleep" has a Jorma acoustic blues Hot Tuna sound. "On My Way Home" is country with a groove and some pretty good playing. "Ordinary" made me stop and wonder if Gentlemaniac were playing a Chris Isaak cover song. And the last track has no title but has a very early Beatles rockin' sound. Overall, a cool set of accessible songs that root themselves in standard styles but mess about enough with convention to result in something that is creatively alternative. 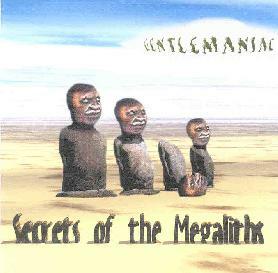 Secrets Of The Megaliths is distributed by Szum Music. You can email them at gmaniac@nr.infi.net.